Bob’s is always looking for ways to keep our customers happy and hopefully thankful to have us as their resource for everything motorcycling, so when new generations or styles come along, we always try to display the best examples of them to you. With the trend for trike motorcycles on the rise, Bob’s went to work and built a custom 2014 Magnesium Beige Metallic K 1600 GTL trike fully equipped with safety package: adaptive headlight, DTC, TPM; Luxury package: LED fog light, Electronic Suspension, Anti Theft Alarm; Bluetooth interface control; radio software; high seat; powerlet accessory; passenger armrests; topcase LED Brake Light; electric reverse; running boards; fully functional ABS, foot vents, stone guards. We mentioned earlier this fall the trike build was in the works but are now happy to report the project is complete and ready for our customers to come and check it out! BMW Master Certified Technician Dave Grunberger really deserves a round of applause folks! While walking us around the finished product, Dave summed up this beast of a machine best by stating, “You’re looking at the best trike on the market, period. It handles perfectly (thanks to the extra wide front wheel), it looks amazing (check out the rear end with the custom horizontal tilted exhaust), it’s fast (just trust us…it’s fast! ), it’s fun, and it’s comfortable. If you’ve gone from a bike to a trike or are considering doing so, look no further. 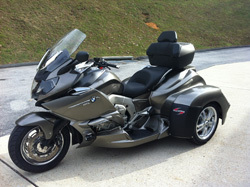 The K1600GTL trike is luxury touring at its finest! The trike is now on display and FOR SALE at Bob’s BMW! View images HERE!